A teenager from St Andrews has made a very generous and personal donation to charity this month. 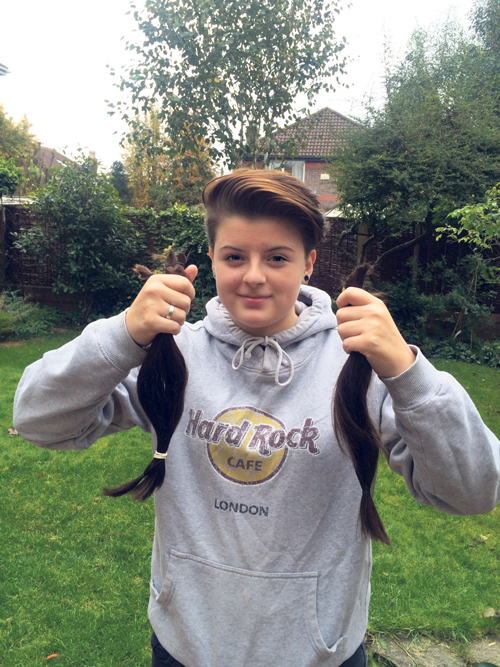 Lily O’Connor Morse, aged 14, has been growing her hair out for a number of years but felt that she could put it to better use. So far Lily has raised donations of over £500 from family and friends to have her long hair cut short, in aid of the Little Princess Trust. The Little Princess Trust provide real-hair wigs, free of charge, to boys and girls who have lost their own hair through cancer treatment and other illnesses. So far they have given away over 4,000 free wigs to children. Lily has been well supported by her friends at Cathedral School who have donated to her Just Giving page www.justgiving.com/fundraising/Lilyocm . “Everyone is aware of what's going on around them and they can see these children struggling with confidence after losing hair from cancer treatment but not enough people are helping by donating their hair. When Harry Styles donated his it seemed like a small but positive change that I could make but one that would make a massive difference to children’s lives. Hair doesn’t mean much to us but it does to a child who’s lost theirs,” said Lily. Jake Toop at Mack Daddy’s on North Street was the hairdresser for the big chop. Lily said: “When I was sitting in the chair, waiting for Jake to cut my hair, I couldn't believe I was actually doing this; I have been growing my hair out for about six years since an absolutely awful haircut and have got used to having long hair by now. Watching my hair come off one pony tail at a time, I felt a bit mournful and sad but I knew I wouldn't regret it as I will be helping someone out. To find out more about the Little Princess Trust visit www.littleprincesses.org.uk .